Governmental documents serve the explicit correlation of identity and affiliation. Palestinian artist Khaled Jarrar uses these attributes as samples for alternative models of identity and anticipates the existence of a state, which until now is mere utopia. He created a stamp with which he stamps passports of travelers and pedestrians in Ramallah, Berlin, Paris and other cities since 2011. 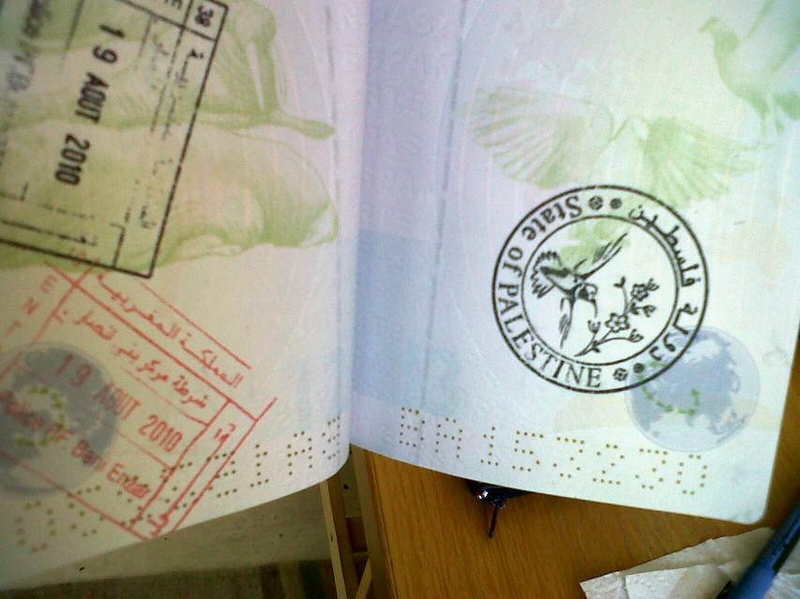 About 240 participants carry a stamp of the State of Palestine in their passport until this day challenging the Israeli border regime. Jarrar undertook his first stamping action at the central bus station in Ramallah for people arriving from the checkpoints. When he goes abroad, he uses any occasion to mark people’s passports and thereby develops a campaign based on nonviolent resistance. These stamps represent a sovereign independent country and opposition to the violent fragmentation of the Palestinian territory. Those who agree to have the stamp put into their documents sustain claims for Palestinian sovereignty and perform an individual political coming out which defines one’s position. A community of supporters grows. Official documents become a manifestation of citizen’s disobedience. And if you have a stamp, you might run into trouble: your entrance to Israel might be denied by border control at the Ben Gurion checkpoint, or you might be sent back to your country of origin. We even know of Israeli passports that have been cancelled due to the unauthorized stamp. Together with the 7th Berlin Biennale, Jarrar also produces postage stamps from Deutsche Post, which have a Palestine Sunbird and the inscription “State of Palestine” printed on them. Over 20,000 have been made so far. Used on letters and postcards, they have circulated worldwide. This entry was posted in Art Centre, Installation, Objectual, Periodic Art Event (biennale, triennale, etc), Photography and tagged 7th Berlin Bienale, Khaled Jarrar, KW. Über Walter Benjamin, Karl Marx, Friedrich Engels und den Palast der Republik | Fotografie. Berlin turns 775 this year, and Galerie Peter Herrmann is contributing with a thematic reference to the anniversary through the eyes of an Afro-German artist. Disappearance as process. Starting in 1989, Manuela Warstat began working – alongside her painting – on a poetic documentation of the changes in the city at the center of her life. Auguststraße is one of many images of the resulting photographic series that will be shown in the exhibition. Dilapidation garnished with bullet holes. So, too, the Berlin Wall on the banks of the Spree, captured by Warstat on video. Over the course of two years, the artist was a witness to the dismantling and demolition of Berlin’s Palast der Republik on the former Schlossplatz. She documented a small, expressive series of this destructive process, compressed here for the exhibition. The dismantled monument of Karl Marx and Friedrich Engels – or, the Marx-Engels-Forum – is closely related. The rapid changes in Tiergarten Süd, the artist’s neighborhood, and Schöneberg, the next neighborhood over, provoked an unusual response to a deceased neighbor. The built environment of Walter Benjamin’s former apartment in the Kurfürstenstraße portrays his surroundings. This entry was posted in Art Gallery, Exhibition, Photography, Video and tagged Galerie Peter Herrmann, Manuela Warstat. Over the last three years, Jörg Brüggemann, member of the respected agency Ostkreuz, travelled to Argentina, Brazil, Indonesia, Malaysia, Egypt, Germany, Austria, Switzerland, and the United States to photograph the fans known as metalheads. So the exhibition “Metalheads” presents vivid images that capture the lives and passion of heavy metal fans from around the world. In some of the resulting portraits, it looks as if Brüggemann not only travelled to different countries but back in time to the 1980s, the period of heavy metal’s supposed peak. But all of these images have one thing in common: they show that no matter who metalheads are or where they come from, they are united by their music across borders, generations, genders, religions, and social classes. The show also feature Brüggemann’s other photographs of the metal scene. Shots taken at concerts catapult the viewer directly into the mosh pit. The atmosphere is captured so authentically that one can practically smell the beer and sweat and hear the ringing in one’s ears. This entry was posted in Art Gallery, Exhibition, Photography and tagged Gestalten Space, Jörg Brüggemann. The exhibition open with a quote on the wall from Dickens and a text from Bracewell. The exhibition is a monumental body of 292 pictures and it is the largest series yet created by the acclaimed British artists. 19 pictures will be shown in Berlin. In these new ‘LONDON PICTURES’ Gilbert & George present an epic survey of modern urban life in all its volatility, tragedy, absurdity and routine violence. Brutal and declamatory, these brooding and disquieting pictures have been created from the sorting and classification by subject of nearly 4000 newspaper headline posters, stolen by the artists over a number of years. In their lucidity, no less than their insight into the daily realities of metropolitan life, the ‘LONDON PICTURES’ are Dickensian in scope and ultra-modern in sensibility. Drawing directly on the quotidian life of a vast city, the ‘LONDON PICTURES’ allow contemporary society to recount itself in its own language. Within the townscape of this moral audit, Gilbert & George appear to pass like ghosts and seers, alternately watchful and distracted, as though their spirits were haunting the very streets and buildings that these pictures describe. The ‘LONDON PICTURES’ seem to comprise a great visual novel, revealing without judgment the ceaseless relay of urban drama, in all its gradations of hope and suffering. This entry was posted in Art Gallery, Drawings / Painting, Exhibition, Photography and tagged ARNDT galerie, Gilbert & George, Michael Bracewell.